The BBC have now responded to my complaint about bias requesting information on their monitoring of bias with the following dismissal. I have appealed to the Information Commissioner on the grounds that this is management information as well as journalistic information and is therefore not protected. Thank you for your rapid response to my complaint of bias over Brexit coverage at the BBC. Data on who you have interviewed on Brexit on national radio and TV, in what programmes and time slots where appropriate (eg the Today Programme), how long they were interviewed for, what their position was deemed to be in relation to Brexit (or why they were chosen). How you monitor impartiality within and between programmes. If it helps, this can be considered to be a Freedom of Information Request as well as a complaint. I am sure that you understand that unless you are gathering and monitoring this (or similar) information yourself you cannot know whether or not you are being impartial. I look forward to your response. The information you have requested is excluded from the Act because it is held for the purposes of ‘journalism, art or literature.’ The BBC is therefore not obliged to provide this information to you and will not be doing so on this occasion. Part VI of Schedule 1 to FOIA provides that information held by the BBC and the other public service broadcasters is only covered by the Act if it is held for ‘purposes other than those of journalism, art or literature”. The BBC is not required to supply information held for the purposes of creating the BBC’s output or information that supports and is closely associated with these creative activities. The limited application of the Act to public service broadcasters was to protect freedom of expression and the rights of the media under Article 10 European Convention on Human Rights (“ECHR”). The BBC, as a media organisation, is under a duty to impart information and ideas on all matters of public interest and the importance of this function has been recognised by the European Court of Human Rights. Maintaining our editorial independence is a crucial factor in enabling the media to fulfil this function. The BBC does not offer an internal review when the information requested is not covered by the Act. If you disagree with our decision you can appeal to the Information Commissioner. Contact details are: Information Commissioner's Office, Wycliffe House, Water Lane, Wilmslow, Cheshire, SK9 5AF, tel: 0303 123 1113 or see https://ico.org.uk/. Please note that should the Information Commissioner’s Office decide that the Act does cover this information, exemptions under the Act might then apply. We don't routinely provide this information as part of our complaints process. However, we have made your specific request known to our FOI team who will respond directly to you in due course. Each programme team put great care into the planning and execution of each episode. Great effort goes into bids for interviews and contributors to ensure a breadth of opinion, taking into account recent guests, their views and arranged guests confirmed for subsequent appearance. When a particular item, like Brexit, is regularly covered, a reasonable period of time is used for including the full spectrum of opinions. That will differ for each programme depending on whether it's a daily or weekly slot, rolling news and hourly radio bulletins will achieve the same over a series of hours as the conversation unfolds in real time. It's not true to say we overlook the Remain argument on the Today programme. Just looking at recent editions alone, it's featured a range of voices about the wider Brexit debate - including Carolyne Fairbairn (CBI), Anna Soubry, Shami Chakrabarti, ex-European Council President Herman Van Rompuy, Ken Clarke, Jo Johnson, Rebecca Long-Bailey, Tony Blair, David Lidington, Justine Greening, Nicky Morgan, and Chuka Umunna. If you have a disability which means you cannot write to the ECU and may need the BBC to provide a reasonable adjustment to access stage 2, you can telephone the ECU on 0303 0806145. I do not believe that the response (included below) provided adequately deals with the complaint as it does not address the points that I raised. I would have preferred to await the results of the Freedom of Information request that I made before submitting this response, but as you have only given me 20 days to respond, and I cannot guarantee that I would have the time to understand the response to the Freedom of Information request whenever I receive it and be able to respond within your time limit. I may therefore need to add to this once I receive that response. Giving undue weight to “hard Brexiters”. Giving undue prominence to Conservative party members. It is rare for a discussion not to include “hard Brexiters”, but may omit Remainers, and it is common for all, or at least a significant majority of the people being interviewed to be Conservatives. The response only provided anecdotal information, which does not go to the core of the problem (the plural of anecdote is NOT data), and does not help to dispel the view that there is bias. Indeed, the failure to provide any sort of numerical data (despite the request) strongly suggests that the BBC is trying to hide something. “Impartiality does not necessarily require the range of perspectives or opinions to be covered in equal proportions either across our output as a whole, or within a single programme, web page or item. Instead, we should seek to achieve 'due weight'. For example, minority views should not necessarily be given equal weight to the prevailing consensus. A hard Brexit is clearly only supported by a minority (a minority that is probably increased by the frequency with which the BBC pushes the idea) but is perpetually offered as though it is the main alternative to accepting the negotiated deal. It is rare to hear a discussion of Brexit on the BBC without the no deal Brexit option being offered, while frequently we do not hear from a remain spokesperson (despite this being a much more commonly supported idea). You also omit many perspectives. You never, or almost never, cover the idea of greater integration with the EU than we currently have, though this is a legitimate idea and part of the perspective and part of the debate that we need to be having, and which you have a duty to cover. I would therefore like to have the data I have requested, and to know what action you are taking to ensure that you end the bias in your coverage of Brexit. Thanks for contacting us regarding the Radio 4 programme ‘Today’ broadcast on 10 November 2018. I understand you felt there were a lack of strong remain viewpoints. Thanks for rising these concerns. The reports on this edition were focused more on Theresa May’s inner party divisions and to gather viewpoints from party members about those concerns. It wasn’t focused specifically on leave or remain viewpoints from the EU referendum. Due impartiality isn’t necessarily always achieved in one single report or programme, so we would ask that you take account of how we cover a topic over time. This means if Jacob Rees-Mogg appears on a programme, then we wouldn’t necessarily have a counter version of Jacob on the programme to offer immediate view. Balance is more achievable over a more reasonable period and the programme features a wide spectrum of political viewpoints. Also note that presenters would play devil’s advocate and put forward counter viewpoints when challenging comments made by interviewees. These interviews can be very robust and aggressive if they feel the interviewee isn’t directly addressing the concerns in the question put forward. Impartiality is a core value of the BBC, and one reason why we believe our news coverage is trusted and respected around the world. We apply this principle to our reporting of all issues. BBC News never takes a position on anything that we cover, but we always aim to reflect a broad range of voices on any given subject. The BBC is of course independent of any political or commercial interests, and our news agenda would never be influenced by any outside organisation. With regards to Brexit coverage in general, we aim to cover the ongoing Brexit negotiations with due impartiality. This means we carry a wide range of views about the European Union from across the political spectrum on our output. As with any story we cover, BBC News does not have an opinion on the European Union, or on the UK’s position within it. Instead we try to explain the different and sometimes complex issues affecting our audience during Brexit. Our aim is to give them the information they need in order to follow the process clearly. We appreciate your concerns and hope this helps to explain how we approach our reporting of this subject. That said, we value your feedback about this issue. All complaints are sent to senior management and programme teams every morning and I included your points in this overnight report. These reports are among the most widely read sources of feedback in the BBC and ensures that your complaint has been seen by the right people quickly. This helps inform their decisions about current and future programmes. Thank you for your rapid response to my complaint of bias over Brexit coverage at the BBC. Unfortunately it doesn’t really address the issue. Although you make assertions that there is impartiality there is nothing in your email which actually demonstrates this. A copy of your policy on impartiality in relation to Brexit. Given the nature of Brexit. I presume that you do have one. If it helps, this can be considered to be a Freedom of Information Request as well as a complaint. I am sure that you understand that unless you are gathering and monitoring this (or similar) information yourself you cannot know whether or not you are being impartial. Once again on the Today programme you are only interviewing Tories on Brexit. It is not as if other parties don't have views on the issue, but you had an interview, quite correctly, with Jo Johnson, followed later by one with a minor back bencher who is a particularly extreme brexiter ie Rees-Mogg. I have yet to hear from an extreme remainer on Radio 4. And whenever Brexit is discussed you seem to want to have an extreme brexiter. This pushes the whole debate in that direction and is not a neutral act. Once again, you are supporting a particular type of brexit by giving it a platform over all other forms of brexit. 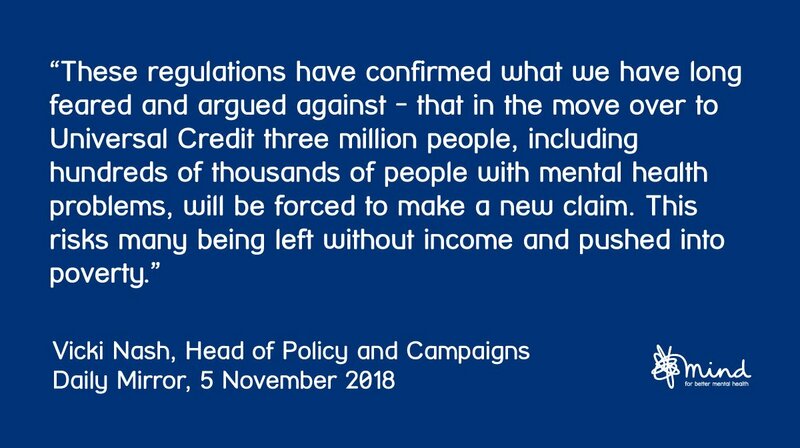 Earlier this week in parliament Esther McVey lied by claiming that Mind, amongst other charities, welcomed the recent announcement from the government on Universal Credit. 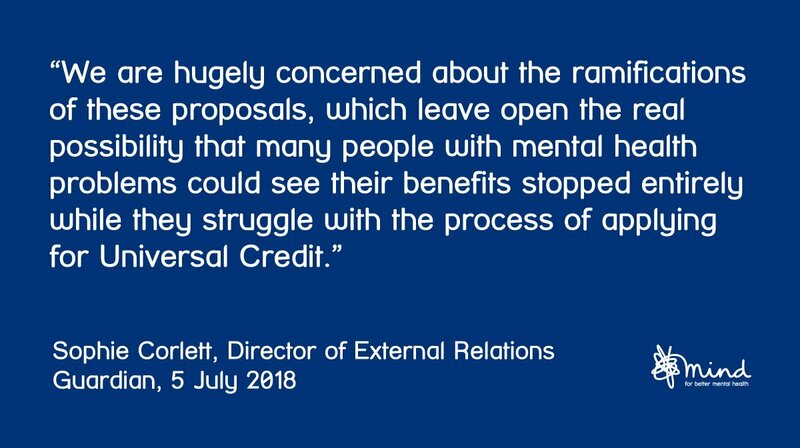 Yesterday the Secretary of State for Work and Pensions @EstherMcVey1 mentioned us in a list of organisations who had recognised and welcomed changes to #UniversalCredit. We thought it was important to set the record straight. Write to Esther McVey to tell her that the current proposals for Universal Credit are woefully inadequate and the roll out must be stopped as a matter of urgency. 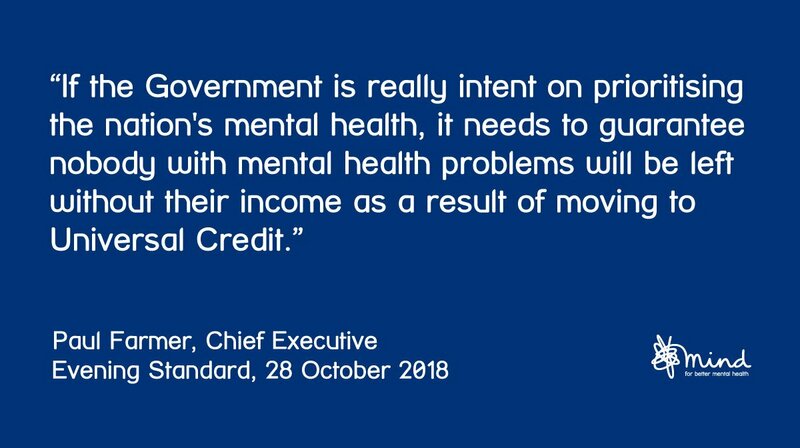 To do all in your power to stop the roll our of Universal Credit and work for its replacement by something that actually helps the most vulnerable members of society rather than punishing them. Thanks for contacting us regarding the Andrew Marr Show on November 4. We've received a wide range of feedback from our audience regarding Arron Banks’s scheduled interview on the programme. To allow us to reply promptly and use our resources as efficiently as possible, we’re sending this response to everyone. We’re sorry we can’t reply individually, but we hope this will address most of the points raised. There is strong public interest in an interview with Arron Banks about allegations of funding irregularities in relation to Leave.Eu and the 2016 EU Referendum. The Electoral Commission has laid out concerns about this in public and it is legitimate and editorially justified for Andrew Marr to question Mr Banks robustly about them, which he will do on Sunday morning. We do appreciate your feedback on this issue and once again thank you for taking the time to contact us. Tomorrow on the Andrew Marr Show Aaron Banks is due to be interviewed. This is giving voice to a fascist currently being investigated for fraud relating to Brexit. This is grossly irresponsible as it is rewarding criminality which was used to get a platform on the BBC (and other sites) in the first place. As Aaron Banks achieved platforming through fraud it is totally inappropriate to reward this by more air time. I have seen in your early response that you claim that this is appropriate to interview people being investigated for criminality. If that is so, what are the editorial guidelines that determine which crimes are worthy of giving air time to those under investigation and which are not? Also, this is not a new story, but one that has been emerging for months, how come you are willing to give the person under investigation TV time whilst you have given almost none for those raising the allegations in the first place. This is evidence of persistent and systematic bias by the BBC in favour of Brexit. I strongly believe that there should be a vote at the end of the negotiations so that people can decide what they want. There are several very powerful reasons for this, and I am sharing some of them with you here. The original referendum was very close. It was only 52% to 48% which is very close, and now more people have dropped off the electoral register than the majority in the referendum. We would be better off with Brexit (all reputable bodies say that we will be worse off under any deal, especially a “no deal” scenario. There will be £350 million a week for the NHS (as the economy is already estimated to be £250 a week smaller than if we had decided to remain this is clearly not true). “Wages will be higher for working people outside the EU… because pay will no longer be undercut by uncontrolled migration.” All economic forecasters are saying that we will be worse off under any Brexit scenario. After we Vote Leave, there won’t be a sudden change that disrupts the economy. – This will clearly not be true if there is no deal, and even with a deal many companies are talking or relocating part or all of their business to Europe. There’ll be no damage to trade with the EU – something which is clearly untrue under any scenario, and disastrously so under a no deal Brexit. Given that only 52% wanted to leave and 48% to remain, it was also clear that there was no uniformity of opinion of what people wanted, going from at one end people who wanted full integration in the “United States of Europe” through reluctant remainers who thought it would on balance be better to reluctant leavers who thought on balance it would be better to leave to hard Brexiters who wanted no deal. In this situation it is clear that we should be going for the least possible Brexit (in accordance with only 52% wanting it all). But that is not going to be offered. In any sensible deal there is a vote to call for negotiations, and then another vote to decide whether people accept the result. If you think of negotiations between businesses and trades unions there is a vote to empower the trade union to negotiate, and then a vote on whether or not to accept the terms. NB if the terms are not accepted then the status quo is preserved, not all the workers leave the business. So, I am asking to press the Prime Minister and Brexit Secretary to support a vote on the results of their negotiations, and to support such a vote. Anything else would be an abrogation of democracy. If the Brexit terms agreed are as good as ministers claim then there should be resounding support, and if people do not want whatever have been negotiated they should be allowed to say so.